One of the perks of having a Linux-based operating system installed is that you can take advantage of using Tmux. It is an excellent alternative for those who do not like or are tired of using GNU Screen. Tmux has the same purpose, which means you can initiate a session and work with as many windows as you want inside it. Since each window is placed on the full screen by default, Tmux also comes with the opportunity of splitting the screen into panes. The crucial benefit of Tmux is that you can use a single terminal to run multiple programs and seamlessly switch to the one you need. You do not have to be afraid of losing your connection because the sessions are persistent. Please note that you will need to use an account that has super-user permissions. Make sure to include the “sudo” prefix if necessary. You will notice that a window is opened within the initiated session and a shell has started in that window. Take a look at the lower part of the screen and notice that Tmux displays basic information about the session at all times. If you do not want to name your session, Tmux will use numbers to name them. However, it is a far better option to use descriptive words because it will help you to know the contents of each window exactly. Simply change the “my_session1” with your desired name. Please note that detaching doesn’t mean that the program will terminate. Tmux will keep running the program even after detaching. The output will show you basic information about various sessions, including when it was created and other relevant data. The important thing to notice is that the session’s name is at the very beginning of the line. In the beginning, you will have one window in a session and a shell that started within it. Tmux will assign a number to the window. You can take a look at the lower part of the screen to see all currently available windows. , – use it when you need to rename the window you are currently in at the moment. 0-9 – choose the corresponding number to change to that window. W – pick a window from the list of available ones. C – create a window and shell. “ – vertically split the pane you are in into two panes. % – horizontally split the pane you are in into two panes. X – close the pane you are in at the moment. ; – switch between the previous and the current pane. 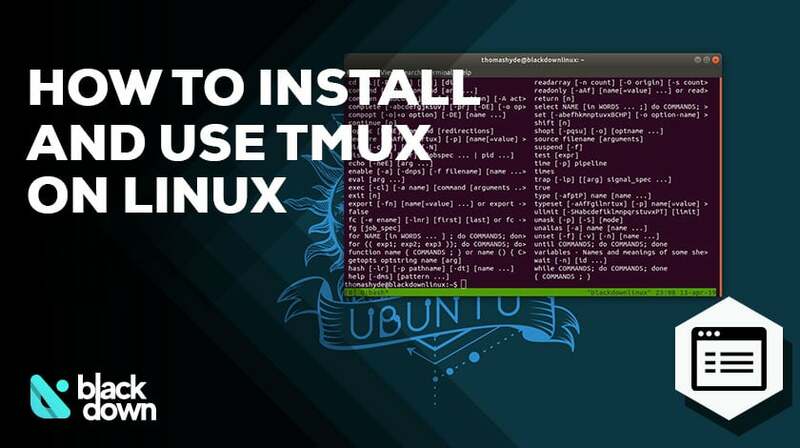 We have now covered all the basic of using Tmux on a Linux-based operating system. Feel free to experiment with the commands and options listed in this guide to learn how to use this convenient alternative to GNU screen. If you consider you are skilled enough, you can check out the “.tmux.conf” file and customize Tmux to your preference, but we feel that the utility is very useful even the way it is by default.